A British guy has just become the first person to jump out of a helicopter without a parachute — and live. With the aid of a modified wing suit that made him look like a human sugar glider, he took a 730m jump from a helicopter and landed on a soft runway of 18,000 cardboard boxes. Even though he encountered some turbulence, 42-year-old stuntman Gary Connery (no relation to 007) was able to use the suit to navigate the bumps and land safely. The suit enabled him to turn, barrel roll, swoop and change directions. He had been training for the feat for weeks by base jumping in Switzerland and Italy and studying the flight patterns of kite birds to see what he could learn from their technique. 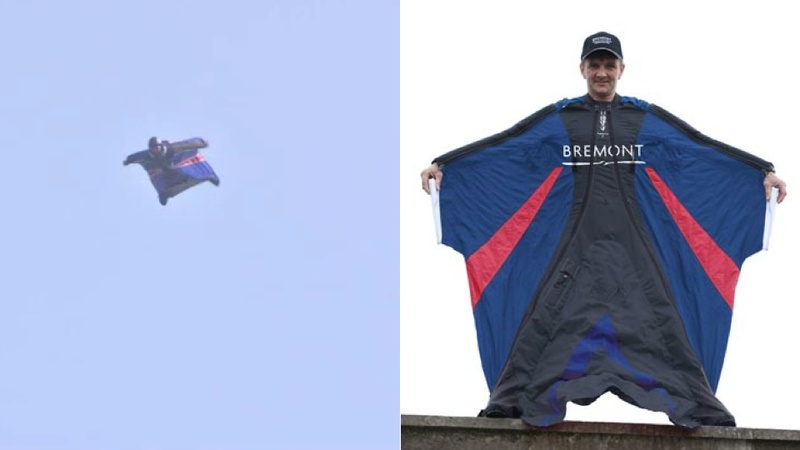 "Kites steer by twisting their tail one way or another and I'll be doing the same," he told Sky News before he took the big jump.